Comixology has just confirmed the rumor I reported yesterday; they are adding an option for DRM-free comics. At the “Ask Me Anything” panel Thursday afternoon, co-founder and CEO David Steinberger confirmed the rumor, saying "We’re excited to make this DRM-free backup option available to our customers and publishers today". The DRM-free comics are available now from the Comixology website in PDF and CBZ formats, but the selection is limited. Comixology is offering this as an option for comic book publishers, but not all have chosen to make use of it. That's fine by me; even a limited selection of DRM-free comics is better than none, and I am sure Comixology would agree. Speaking at the panel, Comixology co-founder John Roberts said "For those out there who have not joined the comic reading community because of DRM, you have no excuse now". I am one of those hold outs; I have avoided buying very many titles on the Comixology platform due to the simple fact that the files were not fungible. Instead I have been buying DRM free comics, including titles from Image Comics (this publisher went DRM-free last year) and digital comics bought as part of bundles. The recently developed DRM-stripping tools did lessen my resolve to avoid Comixology, and today's news will further weaken it. Publishers participating in the DRM-free program include Zenescope Entertainment, MonkeyBrain Comics, Thrillbent, Image Comics, Dynamite Entertainment, and Top Shelf Productions. Also, indie authors who self-publish comic books under Comixology Submit, its indie publishing arm, will also have the option of offering DRM-free downloads. 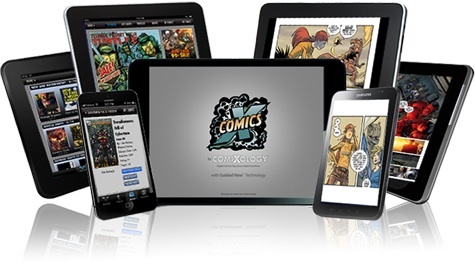 As the acknowledged leader in digital comics, Comixology has enjoyed tremendous growth in recent years. The company announced their 100-millionth comics download in late 2012, and its 200-millionth download last fall. Comixology was so successful that it was acquired by Amazon earlier this year. Wonder if or when Marvel and DC will ever go DRM-free… though at least I can get DC’s single-issue comics as actual EPUB files I can remove DRM from myself (or as watermarked PDFs) on Google Play.